Next Why Am I So Sensitive? Soren Kierkegaard was a nineteenth-century Danish philosopher who lived up to his own highest ideal: to be an individual. To him, that meant being a person whose thought was his own, not that of his age or of the crowd. Kierkegaard’s quotes draw largely from his passion for Christianity, yet his ideas became the foundation of existentialism, a school of philosophy primarily associated with secular beliefs. This owes to the unique way he wrestled with Christian concepts like love, goodness, and moral error. The conclusions he drew are valuable not only to Christians, but to anyone trying to live a meaningful life. Growing up in the shadow of his pious father, Kierkegaard suffered from passionate, unresolved love for Regine Olsen, the fiancée he left because he did not believe he could be a good husband to her. His perpetual melancholy drove him to live a life of intense self-inquiry. He studied the Bible and other Christian texts with great seriousness in his quest for truth. Kierkegaard also constantly examined the society around him. He was one of the first thinkers to examine subjects we associate with the modern age, like anxiety and the chilling effect of social norms on the development of the individual. His writing is dense and circular, showing how he always questioned and re-examined his own conclusions. All the same, he established strong convictions that set him apart. To Kierkegaard, a relationship with God was possible only for the person who turned away from the world and met God as a unique individual. Silence and solitude were prerequisites for spiritual understanding. He thought public opinion was noise and that public religious doctrine ran contrary to the path of spiritual development outlined in the Bible and other Christian texts. Blind adherence to social convention was a sure way to spiritual death for Kierkegaard. Yet he also rejected a life of selfish hedonism and believed obedience to God was essential. He recognised the despair that ultimately arises from chasing pleasurable experiences. Kierkegaard contrasted the life of the aesthetic person, or hedonist, with the life of the ethical person in his magnum opus Either/Or. The life of the aesthete is instinctive and self-focused while the life of the ethical person is contemplative, driven by the concern for others and the measured pursuit of goodness. Kierkegaard concluded that neither mode of living was complete and proposed a third mode that synthesized and transcended the other two: the religious. He spent most of his life writing guidance for people living the religious life, or the life of the knight of faith, in which loving action is grounded in a relationship with the transcendent. The two main lines of Kierkegaard’s thinking that contributed to the development of existentialist philosophy in the century following his death were the importance of the individual and the primacy of action. To the existentialist, the authentic person does not rely on a given definition of who they are or what life is supposed to be. The meaning of life is created through the experience of living and is impossible to condense into a formula or doctrine. To the existentialist, the meaning of life is made, not given. This view went hand in hand with many existentialists’ rejection of the concept of God as the ultimate giver of preordained meaning. However, to Kierkegaard, an authentic life requires a deep relationship with God. Yet like the existentialists, he believed that the meaning arising from this relationship could only be found through the living of it. The essence of his faith was not in accepting doctrine, but following Christ’s example, especially his embodiment of selfless love, or agape. In his voluminous output, Kierkegaard’s most favoured subject was love. For all of his stark musings on anxiety and despair, and for all of his profound abstraction on the nature of ethical action, he always returned to one simple conclusion: that the good and meaningful life is rooted in love. As with Dostoevsky, the love Kierkegaard devoted himself to understanding and living is not the same as sentimental or romantic love. Instead, it is a course of action based on faith and selfless service. It is an embodied virtue that transforms the self as it is lived. Love erodes selfish impulses and replaces them with something far beyond the pleasure such impulses can yield: a peace that is beyond rational understanding. 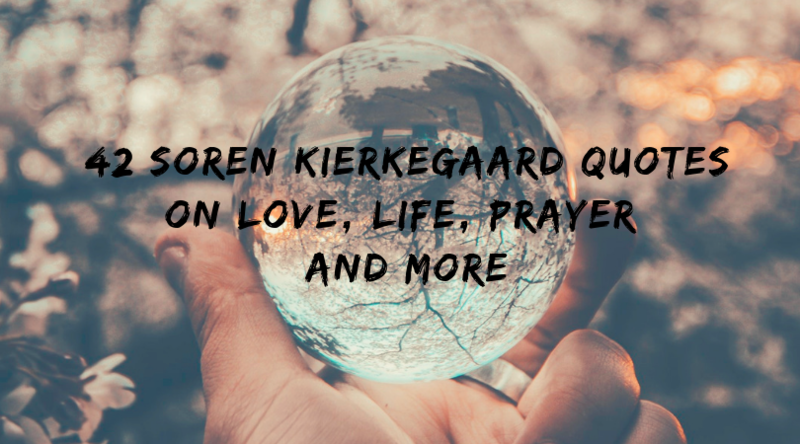 One of Kierkegaard’s primary principles is that “love builds up.” He dissects this Biblical phrase from every angle in the chapter of the same title in Works of Love, but throughout his works, he considers the way the humble life of love improves the soul. Love “builds up” because it is rooted in the universal actions of everyday life, rather than in unique or special virtues. It also “builds up” in that it draws from what is already at hand, being that love is the substance of life itself. These quotes all show why Kierkegaard is considered to be one of the founders of existentialist thought. While many philosophers content themselves with sparkling oratory, the rhetorical force of a statement was not enough to engage or impress this spiritual thinker. For Kierkegaard, a philosophy was only proven valuable when the person who spoke it also lived it. To understand was to constantly stand under the truth, to act from the higher principles that informed your thought and speech. To live is to dare. To Kierkegaard, truth wasn’t something to believe, but something to venture. To take a leap of faith is to act first and learn from action, though again, this is not the same as the hedonist’s impulsive way of living, or a thoughtless life free of self-awareness or introspection. Rather, it is additive: actions aren’t based on calculation, but are informed by the life of spiritual inquiry that preceded them. When actions are “spirited,” they are taken out of a radical conviction of truth. 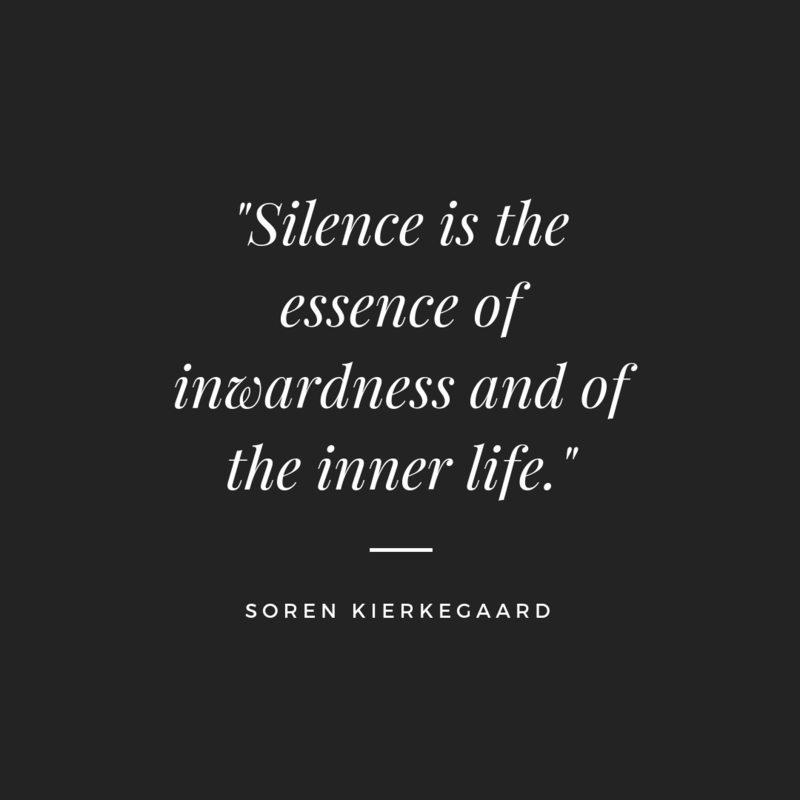 Kierkegaard valued silence so much that one of his many pen names was Johannes de Silentio, or “John of the Silence.” For him, silence was the foremost spiritual quality and a signifier of depth. He likened it to still waters that not only reflect light, but also hide nothing. Just as roiling waters leave only the surface visible, Kierkegaard noted the way noisy human discourse made it impossible to observe the depths of truth. Superficial noise generated merely to entertain was anathema to him. Kierkegaard deeply valued discourse and action. He did not see silence as being opposed to them in any way. Instead, it was the foundation that made them possible. If action is not to be informed by public opinion or received dogma, it must come from something deeper. That deeper source is communion with God, which can only happen in silence. Just as only a calm ocean reflects the moon, only a silent mind and heart can reveal the profundity of the Absolute. As with everything else he considered, Kierkegaard was rigorous in the standards he applied to the act of prayer. He observed the way most of the people around him who identified as Christian used prayer to ask for things they wanted or petition for things to go their way. To him, this was not only shallow, but wrong-minded. Like love, true prayer was something that could build up the soul. Its purpose was not to persuade a God that Kierkegaard saw as beyond persuasion, but to transform the one who prayed. The kind of prayer Kierkegaard emphasised is a contemplative form of prayer that draws the soul into silence. It is the way to make the mind and heart the still pool that reflects the will of God. It is also a way to purify intention. 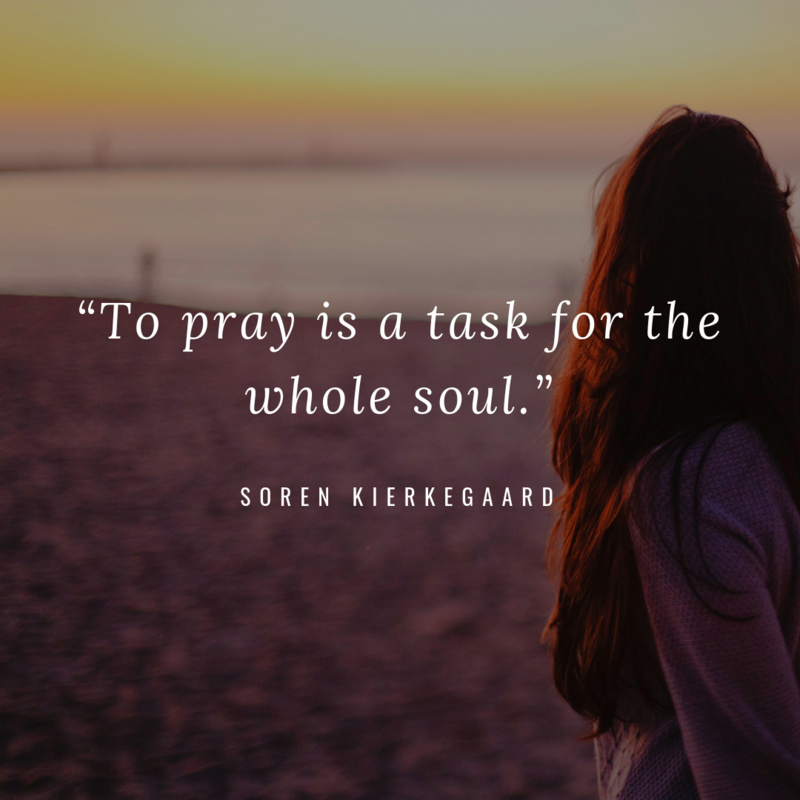 Kierkegaard noted that most prayer reflected what he called “double-mindedness.” The petitioner did not truly want what was good or what reflected the will of God, but what helped them get pleasure or avoid pain. He observed that by relinquishing these ego-driven demands, the one who prayed could find greater peace than if those requests had been fulfilled. Kierkegaard wrote extensively on the experience of despair. He defined it as the loss of the relationship with God, which leads to the loss of self. Kierkegaard’s concept of God was of the Absolute, of the very ground of being; he saw the loss of the relationship with God as a profound disconnection from life. Regret can lead to despair, but it doesn’t have to. Regret is a crossroads. Guilt burdens and restricts the soul, but it can be relinquished by making a choice. That choice can be to relinquish hope or to do what it takes to reconnect to God and to life. The process of atonement can intensify the light of the soul, strengthening virtue and self-knowledge. 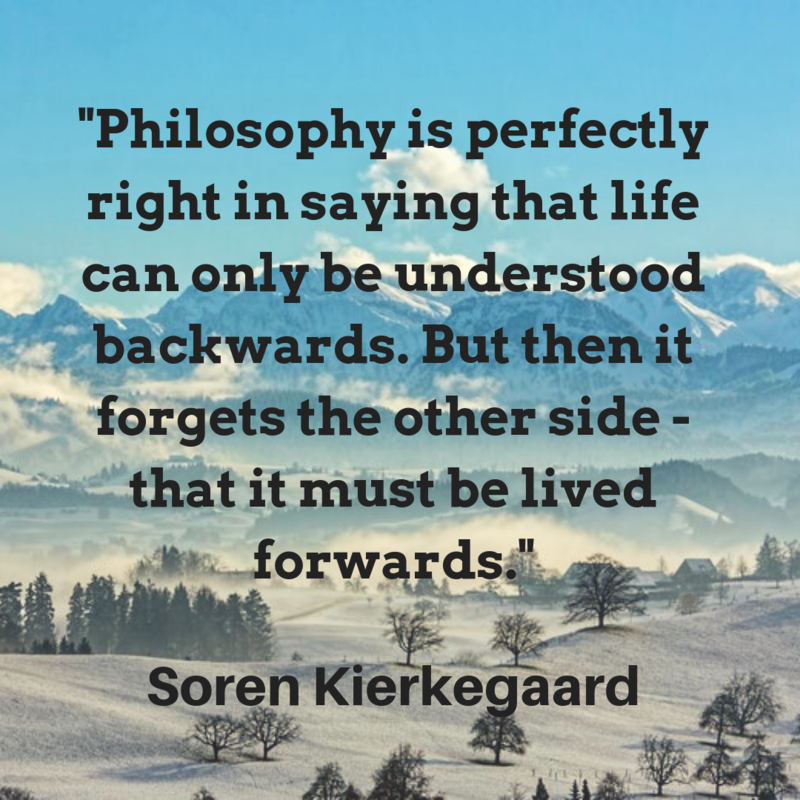 Kierkegaard’s final quote above playfully reflects on the typical human relationship with life. No matter what you do, you’ll probably regret it, or at least wonder how things could have been if you’d done otherwise. 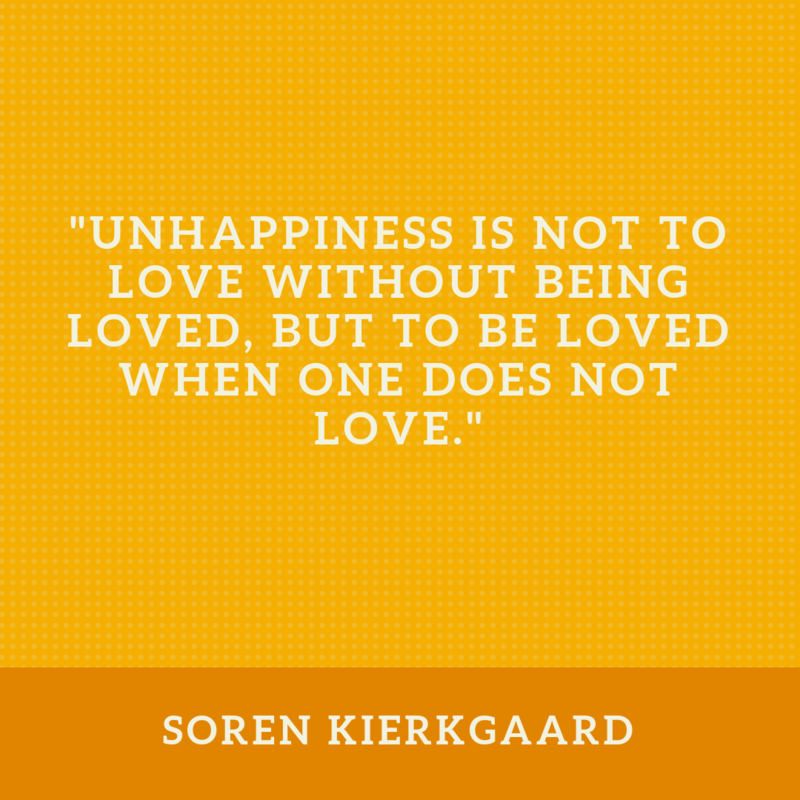 Like most of Kierkegaard’s quotes, it has layers of meaning. He wrote many of his works not just under different pen names, but under different personas. This quote is written in the voice of an aesthete flirting with the despair that typically comes with a hedonistic life and points to the cost of living that way. All the same, it’s true: regret is a natural outcome of any life. Whether the person who regrets gives in to despair or embraces life depends on whether they can take a leap of faith and act from a deeper truth.